Beautiful Montina Beach on Lake Travis - Walk to the Water! 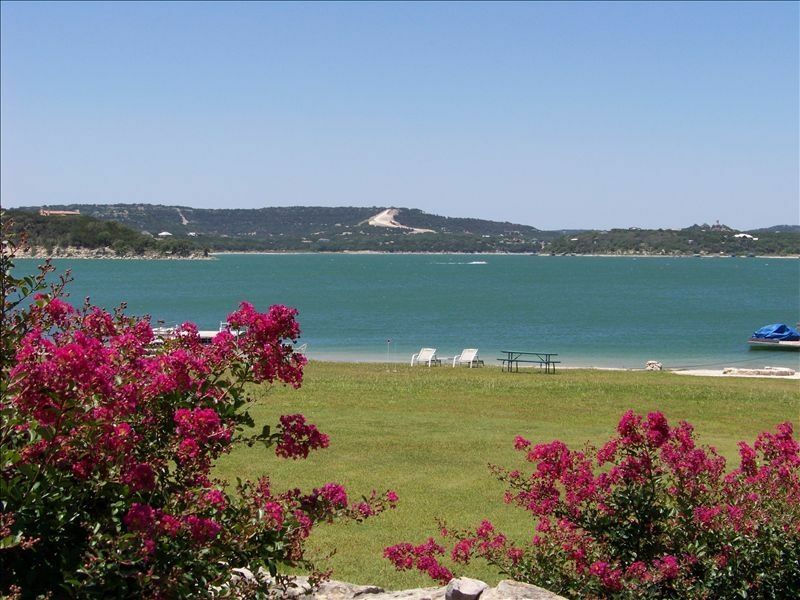 Montina Beach is one of a few properties on Lake Travis with a gradual slope to the water. The park like setting from the beach area has been described by a real estate appraiser as the 'FINEST LAND on Lake Travis.' The view looks out across one of the largest areas of the lake with some of the largest hills in the Texas Hill Country as the backdrop. You will find this lake front area much more scenic than anything in Lakeway due to the larger lake area and the bigger hills; and much closer to town/amenities than Briarcliff or Lago Vista. The beach area is large and covered mostly with grass. There is a large rock bon fire pit for those special evenings with friends. Yes, wood is supplied complimentary. Please check in advance to see if there is a burn ban or if the pit is underwater. There is also a grass volleyball court for your energetic gatherings with friends. The property is located on the highly desirable south shore of Lake Travis, close to Austin's vibrant lifestyle and near all the amenities you desire from the finest in shopping at the new Hill Country Galleria and Lakeline Mall to great restaurants including Hudson's on the Bend, Rocco's, The Grove, Steiner Ranch Steak House, The Oasis, Mesa Rosa and Ray's 827 Restaurant.. There are six exceptional golf courses within ten minutes drive. The house is located on approximately six acres with another house that the owners live in. Austin's legendary night life must certainly be experienced if you have never been to downtown Austin at night. The house is a great place to stay with friends when in town to watch the exceptional athletic programs of the University of Texas Longhorns. It is about a 25 minute drive to downtown or the UT campus. Boat and jet ski rentals are available nearby; or launch your own at a nearby marina and park it at the dock on premises. Spend a day wakeboarding, water skiing or parasailing. Yes, they will pick you up right on your boat dock to go parasailing! If you are young enough in spirit, you may also want to venture into Devil's Cove for one of America's biggest parties every summer weekend - it is a five minute boat ride away. The house has a wonderful open design. The kitchen, living room, breakfast area and dining room are all combined in a very large area without walls that makes for a great social gathering point. There are two outdoor living areas for your enjoyment. One bedroom has a king size bed and a private bath. The second master bedroom has a queen bed and also a private bath and must be accessed either through its own private entrance from the outside or by going through the third smaller bedroom. The small bedroom has a full size bed and a pull-out twin bed that recesses under the full size bed. The smaller third bedroom has access to a third, common area bathroom. A comfortable sleeper sofa is located in an area of the great room and a twin bed sleeper sofa is also available in the living area. Please note that photos were taken with the lake level at a more normal level and the lake levels can fluctuate from drought to floods. Please ask the owner if you want to know the relative lake level. We allow 1 dog under 20lbs of friendly breed and house broken. There is a pet fee of $150. NO PETS ON BEDS OR FURNITURE. Must be with owner at all times. You will love the vast wide open feel of the beach with its absolutely spectacular view, which is framed by some of the largest hills in the Texas Hill Country. The house is located on Lake Travis but close enough to downtown Austin, the University of Texas and the many lake area activities to make it convenient to nightlife and UT sports and places such as The Oasis or the Hill Country Galleria. Choose a peaceful evening under the stars or all the action you want at the places above. toilet, shower, Full size shower in all beautiful travertine stone! toilet, combination tub/shower, Combination tub/shower - all beautiful travertine stone! toilet, shower, Smaller shower with all ceramic tile surround. Enjoy the beautiful travertine stone bathrooms in the two larger bedrooms. Two houses are on the 6 acres (approximately) of land and share the beach area, which is at least one acre in size. Please note that the water level of Lake Travis fluctuates so the lake may be higher or lower than shown in the photos. Strict limit of four vehicles due to space limitations. Please NO parking on grass! A very large open floor plan that is great for entertaining and gathering with friends. Large stainless steel refrigerator/freezer with icemaker and filtered water dispenser in the door. This property has both a drip coffee maker and a Keurig coffee maker. Fully equipped kitchen with granite counters, stainless steel appliances, bar and three bar stools. A breakfast area and formal dining area are part of the very large open concept floor plan. Breakfast table seats four. Formal dining area seats six. Both are located within the very large open floor plan design. There is also a granite bar in the kitchen with three bar stools. 55' Sony high definition LED TV in the living area. 2 Bedrooms have smaller televisions. All have Dish network. Three large patio areas with travertine stone flooring, large slate table and cushioned chairs. Small swim/boat dock on property (there is a $50 usage fee), volleyball court (grass) on the beach, and picnic tables on beach. Fire pit only available if there's not a burn ban or if pit is above the water level. Call owner before arrival for this information. Great location and beautiful beach house. This house was the perfect location with a view of the water from the backyard. We woke up to a beautiful view and decided to have a picnic down by the beach area. All of the rooms are beautifully decorated and the house was very clean. I would recommend this place to anyone. This wonderful lake house was perfect for us to feel like we were on a great vacation without all the travel time and expense! Just 30 mins from our house we got to relax in a wonderfully equipped vacation home and spend our days jumping off the swimming dock into Lake Travis. Overall a carefree relaxing vacation weekend! We would definitely do it again! Property was great and perfect for our family of 6! Would stay here again anytime! Great place for a family gathering! Home was beautiful, had everything we needed and was open and comfortable. Plenty of outside patio space, beautiful views of Lake Travis and a great dock to hang out, swim, fish and spend the evenings! Everyone loved this house! Can’t go wrong staying here! We really enjoyed our stay at Montina Beach. The house set up was perfect for our family & it was great to have full amenities to stay put after a crazy few days of college graduation festivities for our daughter. It was very relaxing & comfortable. We rented a boat one day to go water skiing & tubing. The marina was close, convenient & a boat is a great way to enjoy the lake. When we had an issue with the satellite TV the owners were quick to reply & have the situation fixed. Everything else went smoothly....we would definitely consider staying here again! This guest house on Lake Travis was the perfect fit for our small family gathering. We were in Austin with the intent to visit extended family on Hudson Bend without being intrusive, and this simple and welcoming guest house was a great solution in a beautiful setting. Our group of 9 (including 3 small children under the age of 3) thoroughly enjoyed the ample living / dining space and beautiful and spacious outdoor space - especially the dock and access to the water where the kids and adults alike could explore, swim and take full advantage of being outside and on the lake. The house was ready for us when we arrived, had instructions for anything we needed during our 6 day visit, and accommodated our comings-and-goings to visit family nearby incredibly well. This is a guest house located in close proximity to the main house, but we certainly enjoyed the views and had almost full access to the property, so it was certainly no issue for our stay. Thank you to Phyllis for making this property available - it suited our visit incredibly well! Will certainly look into this option again in the future. Beautiful property but linens and towels could be replaced. Most of them were stained. The property is located on the highly desirable south shore of Lake Travis, close to Austin's vibrant lifestyle and near all the amenities you desire. From the finest in shopping at the new Hill Country Galleria and Lakeline Mall to great restaurants including Hudson's on the Bend, Rocco's and Ray's 827 restuarant. There are six exceptional golf courses within ten minutes drive. T There is nothing like a sunset boat cruise and dinner at a waterfront restaurant, then a leisurely moon light boat cruise back home. 25 Minutes from Downtown Austin. We except 2 night stays May24- August 31. Nightly rate for up to 9 persons is $459. Holidays not included. You must contact owner for 2 night stays.Pet Policy- 1 dog- Under 20 pounds $150. Only friendly breeds allowed. Must have permission from owners in advance. Additional fee per person/per night is $40. (over 8 Persons/ limit of 9). Sorry, No Parties! Swim/day dock is available. There is a $50 usage fee. PLEASE remove trash after your use. Damage protection protects travelers for up to $1,500 in damages with no deductible. No more than 9 people are allowed on the property at any given time. There is a strict limit of four vehicles for parking and no extra parking is allowed on the street. Quoted rates are for payment by e-check.